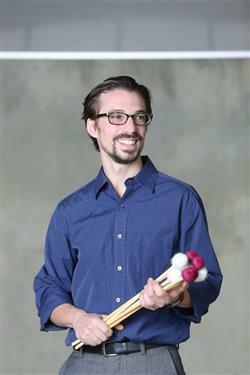 Percussionist Dan Piccolo has performed, taught, and studied internationally during his twenty-year professional career. He is currently Assistant Professor of Percussion in Bowling Green State University’s College of Musical Arts. Dan holds both a DMA and BM in Percussion Performance from the University of Michigan School of Music, Theatre & Dance, and during his Master’s studies in U of M’s Jazz Department he focused on improvisation. He has studied concert percussion with Michael Udow, Salvatore Rabbio, Joseph Gramley and Jonathan Ovalle, among others, and his drum set and improvisation teachers have included Michael Gould, Steve Curry, and Ed Sarath. Dan is also skilled in several forms of non-Western percussion, having studied frame drumming with Jamey Haddad and tabla with Pandit Kuber Nath Mishra in multiple visits to Varanasi, India. A grant from the University of Michigan’s International Institute funded the first of these visits, and he returned to Varanasi in the winter of 2015 thanks to an award from the Presser Foundation. An additional award from U of M’s International Institute made it possible for Dan to begin formal studies of West African music in Ghana in the summer of 2014. In 2014 Dan was appointed as a member of the Percussive Arts Society’s World Percussion Committee. Dan’s performance credits include a wide range of musical settings. He has appeared as a soloist with the Toledo Symphony Orchestra, the University of Michigan Percussion Ensemble, and others, and as a guest artist at colleges and universities throughout the United States. His active performance schedule has earned him invitations to perform at the Percussive Arts Society International Convention and the annual conference of the International Society for Improvised Music. For six years Dan was the drummer with Nomo, with whom he toured internationally and recorded three albums for Ubiquity Records. Dan has also toured and recorded as a member of Cloud Nine Music, The Ragbirds, His Name is Alive, and others. Dan performs regularly with symphony orchestras, rock bands, Indian classical music ensembles, jazz combos and big bands. He is currently a member of the X4 Percussion Quartet, Ensemble Duniya, Big Fun, and the Mark Stone Trio. Dan is also active as a composer, writing and arranging music for and featuring percussion instruments. In April 2010 the University of Michigan Percussion Ensemble premiered Dan’s first major work for Percussion Ensemble, “PTA,” which features tabla, drum set, and optional electronics soloists. Dan has a number of works for percussion soloists as well as ensembles of varying sizes and configurations. In addition to his busy professional schedule, Dan is an active educator, teaching all percussion instruments in private and classroom settings. He has presented workshops and masterclasses at universities throughout the United States, and has twice been selected as a clinician at the Percussive Arts Society International Convention. Dan spent six years as the coordinator of the percussion program at Ann Arbor’s Pioneer High School, during which time the school was twice named a Grammy Signature School. In 2016 Dan was appointed Assistant Professor of Percussion in the College of Musical Arts at Bowling Green State University in Bowling Green, Ohio. Prior to this appointment Dan was Assistant Director of Percussion at the University of Tennessee at Martin. During the summers Dan serves as Head of the Percussion Area at New England Music Camp in Sidney, Maine. Dan proudly endorses Cooperman Frame Drums, Zildjian Cymbals, Innovative Percussion sticks and mallets, and Pearl/Adams percussion instruments.